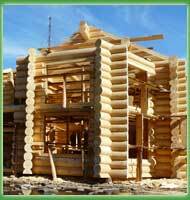 If you wish to build a handcrafted log house or a bathhouse of high quality, but paying reasonable money for it, you should pay attention to production of our company. 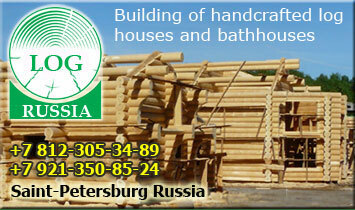 The building company "Log Russia" (Russia, Saint-Petersburg) offers to you handcrafted wooden houses with delivery and assemblage on your country residence. 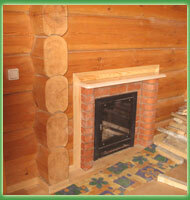 A log shell can be made on your project or our architects will develop the project for you according to your wishes. - log shells made of a semioval log (oval-flatten) using the Norwegian bowl. Except base approaches our masters know and actively apply the most perfect technologies of log home building : the Canadian and German technology of "curtaining of external corners" of house, use of couplers for face connection of the logs, already noted notches and a dowel in a round cup, use of a special groove "undercut", unloading saw cut and also many other modern technologies of building. Having addressed to us, you can be assured, that your future house will be made by the best experts putting a part of their souls in the work. At the expense of technologies used by us your house or a bath will please you for long years, remaining same beautiful and warm, as well as in the first months after building. Certainly, you can ask yourselves a question, why should I get involved with the company from far Russia? At first we will answer shortly: you receive a house of the European quality, but for much smaller money. - Application of the best European technologies. Why should you pay more for a similar work? Many of your compatriots with pleasure live in the houses constructed by masters from Russia. 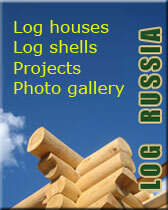 In more details about our company and houses made by us you can read on page "About the company". - Projects of houses and the baths, interesting articles, an order of pricing of cost of our shells and other useful materials. Call, come  we are waiting for you! We invite dealers in various regions of Europe to cooperation. 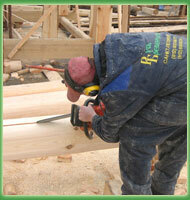 Modern housebuilding technologies. 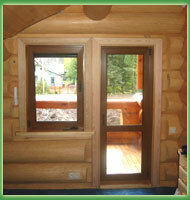 If you do not know differences between the Canadian, Norwegian and Russian building technologies. If words "notch", "dowel", "curtaining of corners", "oval-flatten" etc. do not mean anything for You, we insistently advise to familiarize with this section. You should understand, for what quality of the house you pay. Our prices. Cost of a log shell and its installation. The basic competitive advantage of our company - the best parity quality/cost. It is fair for Russia and it is twice fair for the West European countries. 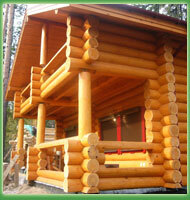 Familiarize with pricing principles on our log houses. Learn how it is possible to save. Photo gallery. In this section you can find photos of ready houses and baths, and photos of houses being under construction. 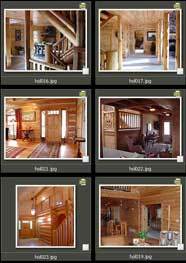 Photo sessions devoted to facades and interiors of log homes and baths , and also thematic selections of photos are offered you. More than 1000 photos. Projects of houses and baths. Get acquainted with projects developed by our design bureau, and also the best works of other architects. Many projects of cottages and baths. 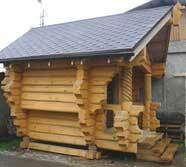 Articles about designing and building of log houses and baths. It is desirable to study on other's errors, therefore in offered articles of our authors and the selected materials of specialized editions, we have tried to inform to you all best of experience of wooden housing construction. More than 100 articles (in Russian). 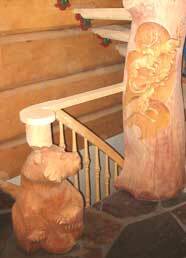 Wish to decorate Your house with a carved wooden figure? Then look at work of our carvers. 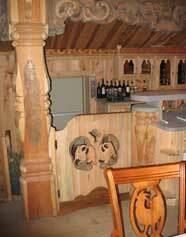 It is possible to decorate the house with carved columns, carved panels, platbands, etc. 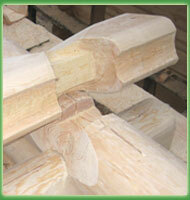 The cosiness in a country house is created by means of small forms, also carved manually. 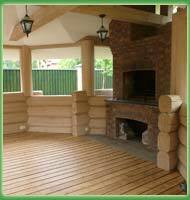 These are beautiful pavilions, benches and tables, awnings for a barbecue, etc. Detailed photosession about the house and a bath (Rus). Appearance and design of interiors. Greater photos.